Aston may be on the cusp of unleashing a torrent of new models, but it's not done pilfering what it has on hand to create another variant of a variant of a variant. Now, without a roof! Still, who doesn't want to see if their perfectly coifed hair holds up at 201 mph? That's the top speed of the V12 Vantage S Roadster, which comes packing the 6.0-liter V12 from the coupe, good for 565 hp and 457 lb-ft of torque. Zero-60 happens in 4.1 seconds, up from the coupe's 3.9-second run, and hauling it all down is a massive set of carbon ceramic stoppers at each corner. 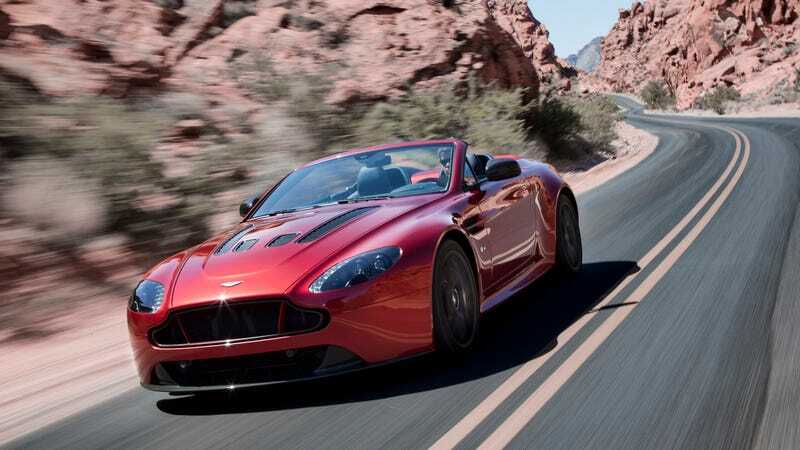 Good news: Unlike the original V12 Roadster, we'll be getting it in the States. Bad news: The six-speed stick has been swapped in favor of a seven-speed automated manual. But there are worse ways to drop $200-large.